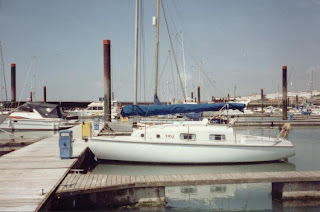 I seldom own a boat for more than two seasons and one of the bigger ones was ‘Trio’, a Kingfisher 26 Mk 2, rigged with a junk mainsail. She was designed by R.A.G. Nierop who was the managing director of Westfield Engineering where the yachts were manufactured. I owned her from early in 1994 to the end of the season in 1995. I remember meeting Nierop at a London Boat Show when he was promoting his Kingfisher 22. I said I very much admired the construction and design of the yacht, but thought I would never be able to afford one. He encouraged me by saying that my financial circumstances may improve in later life. 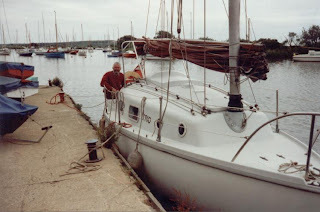 Many years later I found 'Trio' in a state of neglect at a boatyard by the River Deben. There was very little wrong with her except she had accumulated moss on her decks. By using a power hose I was able to make her almost like new. She was a very easy boat to sail. If any effort was required, it was when raising the sail, but this could be done with a winch which was fitted to the cabin top within easy reach of the crew when standing in the cockpit. The sheet was very long, because it had to pass through several blocks, but the tail end could be tidied by dropping it into a built-in a pouch without coiling, so that the sheet could run freely without snagging. ‘Trio’ was tacked by moving her tiller; there was no adjusting of sheets or expenditure of energy when winding winches to secure jib sheets, because she had none! She never failed to come about. Standing headroom and a dinette made her a very comfortable family boat. Up forward there was a cabin with two berths, and in the saloon there were also two berths. The galley was on the port side at the foot of the companion way and her navigation station with a table was to starboard. She had a separate enclosed heads with a basin on the port side. However, the thing that concerned me was the number of holes in her hull. There were seawater intakes for the sink, heads, engine, cockpit drains and the engine exhaust tube. Each one of them had stopcocks that required maintenance. I can’t remember the make of her diesel engine which was housed under the bridge deck, but it never failed to start and it could push the boat along at about 4.5 knots. Fifteen gallons of diesel were stored in each of the bilge keels and water was stowed in plastic cans in the port cockpit locker with a supply pipe to the sink. All of her fittings were made from top grade marine materials, such as bronze and stainless steel. I did several cruises with her - including a trip to Falmouth and a delivery passage with her new owner to his home port of Peterhead. such beauty – do you have any idea where to get such a kingfisher 26jr (for a reasonable price)? PhyshBourne, as at Wed 21st Dec 2011 these are for sale: the first is junk rigged. thank you very much, indeed, for your posts.